So what counts as social media automation? To summarize, they identify social media automation capabilities as content discovery, performance measurement and post scheduling. Instead, I immediately thought @mention spam. I thought automated “Thanks for following me and please check out my blog here at www.purelypromotionalcrap.com” DMs. I thought blast publishing tools that consumed unread content from RSS feeds and spewed unreviewed posts to as many social networks as possible. So which is it? Can social media automation as a buzzword and label mean something less insidious than the spam labels that I was so eager to smear it with? Can it just mean tools that automate social media tasks (content discovery, scheduling) that remain manual for many marketers without being thoughtless and spammy? Can it grow up? 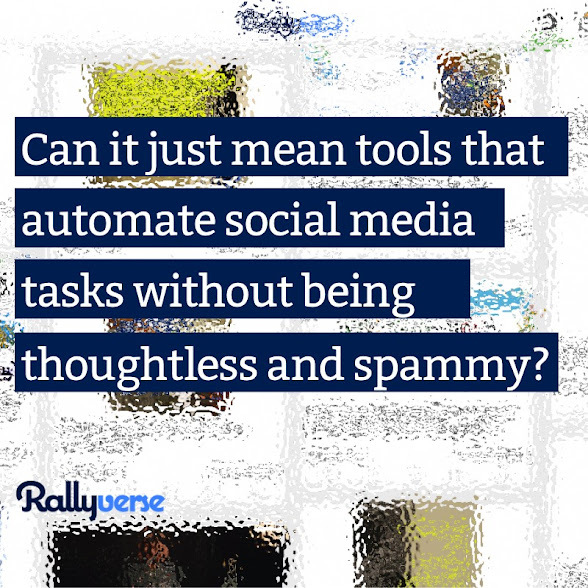 And, most importantly, have we been building social media automation at Rallyverse all along?